I am writing to announce that UIC United Faculty will hold a strike authorization vote beginning next Monday, April 8th through the 10th. Details on voting times and locations will follow soon. Your participation in this vote is critical. As a reminder, a strike authorization vote is the first step toward being able to strike, but it does not guarantee a strike will happen. The bargaining team, after being authorized, decides whether or not to call a strike based on what is happening at the table. We do not go into this lightly. We have been negotiating since June 2018 and our contract expired in August. Our bargaining team has won many important concessions, but on issues of pay and equity, we have yet to see a serious offer. While enrollment booms and billion-dollar infrastructure plans are being touted proudly, we are being told to tighten our belts and accept a sub-par compensation plan, without any provisions to offset anticipated increasing health care costs. 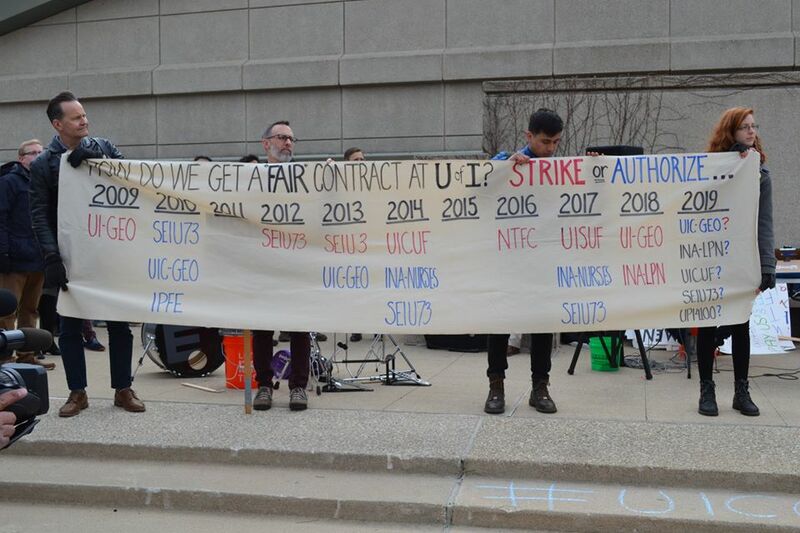 Authorizing a strike is one of the strongest tools union members have to exert pressure at the bargaining table, and unfortunately, the UI system’s recent history suggests that the administration won’t give us a fair contract without this escalation. Among the hundreds of faculty we’ve spoken to so far, there is a serious and growing concern that a fair contract won’t be reached without putting the possibility of a strike on the table. In advance of the vote, UICUF organizers and volunteers are continuing to have one-on-one conversations with colleagues, and we encourage members and non-members who want to weigh in or learn more to reach out to your College Rep or our Executive Board. On a final note, we are filing Unfair Labor Practice charges against the administration because of their efforts to use faculty to break the GEO strike under the guise of “supporting our students.” As the administration bears the responsibility to settle a fair contract with us, so too do they bear the sole responsibility for resolving the GEO strike. That is true support for our students. I want to thank you all for your determination and support in these challenging circumstances. Together we will win this!